Differences are only barriers if we allow them to be. What is the Build Cultural Awareness Initiative? Our Build Cultural Awareness Initiative provides opportunities to learn about other cultures, faiths, and people of different backgrounds. Begin the journey yourself, or learn with others who share a common interest and make new friends. Create a safe space to ask questions and gain understanding. Read the blog, watch the videos and learn about the #BuildCulturalAwareness topic. Ask someone else to join the discussion so you can make new friends and learn from their experiences. Share your ideas, photos, related stories, and facts about your culture or something you’ve learned on Facebook, Twitter, and Instagram. From this fundamental truth, diversity expert Howard Ross explores the biases we each carry within us. Most people do not see themselves as biased towards people of different races or different genders. And yet in virtually every area of modern life disparities remain. Even in corporate America, which has for the most part embraced the idea of diversity as mainstream, patterns of disparity remain rampant. Why? Breakthroughs in the cognitive and neurosciences give some idea why our results seem inconsistent with our intentions. 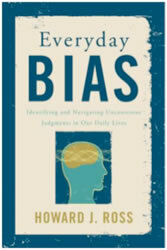 Bias is natural to the human mind, a survival mechanism fundamental to our identity, and overwhelmingly unconscious. While the vast majority of Americans consider themselves unprejudiced, many of us unintentionally make snap judgments about people based on disability. This may be a significant reason many people in the U.S. have reported feelings of discrimination. Subconscious prejudice—called “implicit bias”—has profound implications for how we view and interact with others who are different from us. It can hinder a person’s ability to find a job, secure a loan, rent an apartment, or get a fair trial, perpetuating disparities in American society. The Love Has No Labels campaign challenges us to open our eyes to our biases and prejudices and work to stop ourselves, friends, family, and colleagues from being influenced by them. Rethink your bias at lovehasnolabels.com.